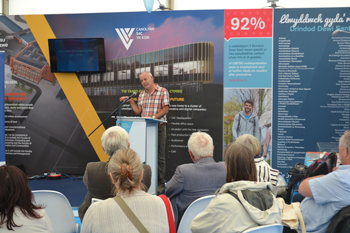 A number of people came to join us at our Friends of the Dictionary session held in the University of Wales’ tent on Wednesday afternoon at this year’s National Eisteddfod. 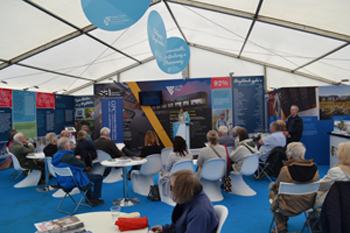 It was good to see those who came along to listen to talks from the Friends President and chief bard, Myrddin ap Dafydd, and from the dictionary’s Senior Editor, Angharad Fychan. Those who joined us for the Friends launch in June will recall Myrddin entertaining us with examples of words and terms associated with brewing. His topic on this occassion dealt with various terms connected to poetry and demonstrating to us the wealth of definition and explanation around this art form that is to be found within the Dictionary. Angharad talked about some of the more recent inclusions to the Dictionary including pilaff (pilau). Hard to believe that the earliest occurrence we’ve unearthed is from the January 1896 edition of Papur Pawb which discussses dining out in Palestine. Arwel Ellis Owen, the chairman of the CAWCS board of directors, urged and encouraged those who were not already members to sign up with the Friends of the Dictionary. 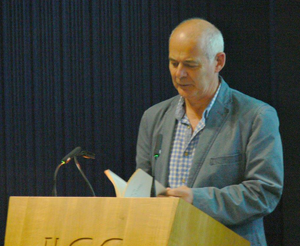 Saturday June 17th in Aberystwyth saw a successful launching of our Friends of the Dictionary. 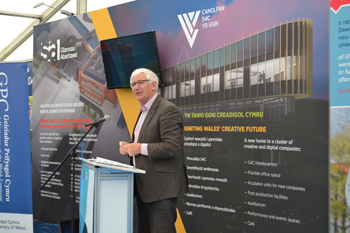 The society’s president, chaired bard Myrddin ap Dafydd, outlined the benefits of being a Dictionary Friend. Friends president Myrddin ap Dafydd. “And these days,” added the president “more than anything else, it’s good to have Friends to help protect and conserve the Dictionary”. He went on to say that “The Dictionary is an integral part of the infrastructure of the Welsh language and, as such, is an entity deserving of it’s own charter and independant budget. There is work yet to be done to make this collection more accessible to learners across many languages”. The afternoon also included a glimpse of the work of the Dictionary as described by Andrew Hawke and Angharad Fychan as well as informative and amusing recollections from Myrddin ap Dafydd, Dafydd Johnston (Director of the Centre for Advanced Welsh & Celtic Studies ) and Tegwyn Jones, a former member of the Dictionary staff. Every Friend of the Dictionary will receive a regular newsletter, an invitation to an annual lecture and significant discount when purchasing volumes and fascicles. For a fuller account of the afternoons proceedings click here. On Saturday 17 June Geiriadur Prifysgol Cymru will launch its Friends of the Dictionary scheme which aims to promote the Dictionary to the widest possible audience. The launch will take place in the Drwm, the National Library of Wales at 2pm, and a warm welcome awaits all those wishing to join us for an afternoon of entertaining talks, light refreshment, and the opportunity to visit the Dictionary offices. 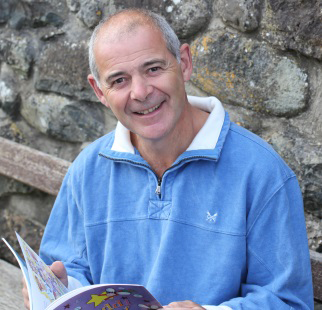 Speaking at the event will be the society’s President, the distinguished Prifardd, author, dramatist and publisher, Myrddin ap Dafydd, along with other guest speakers. There will also be an opportunity to meet some of the Dictionary staff and to learn more about this important resource and its role in Welsh life and culture. telephone us on 01970 639094. The event is free and open to all and we very much look forward to seeing you there. Talking about the weather is second nature to us and is a well understood and accepted way to fill a gap when there’s a bit of a lull or hiatus in the conversation. And, if it happens to be snowing, you can bet that we’ve all got something to say on the topic. So, just how many Welsh words and terms are there to describe snow? In the Dictionary of the Welsh Language there are quite a number, some of them very old. For example, briwod (fine snow driven by the wind), and cynneiry (a first fall of snow) are mentioned in the c.1400 Red Book of Hergest. The poet Iolo Goch, writing in the 14th century, refers to snow as ‘nyf’ whereas Dafydd ap Gwilym talks about ôd, a word that remains in use in some regions through the verb odi (snowing). On a snowy ‘eiriog’ day, you might receive a fine dusting ‘ffluwch’, a light shower ‘ffrechen’, or a gentle fall ‘sgimpen’. Snow blowing in on the wind ‘eirwynt’ can cause a drift ‘lluwch’ or ‘lluchfa’ of fine snow ‘manod’ (mân ôd, eira mân) sufficient to keep us off the roads and from getting to work. And, inevitably, after a few days the pristine white ‘gwynneiry’ and wind-blown snow ‘hiffiant’ will turn to unsightly and dirty slush ‘isgell’ or ‘potes eira’. Do you know of any old or unusual local or regional words for snow or other variety of weather? Have a look to see if they are recorded in, the free to use, GPC Online and, if you don’t find a corresponding entry please get in touch with us at gpc@geiriadur.ac.uk or write to us at: Geiriadur Prifysgol Cymru, CAWCS, National Library of Wales, Aberystwyth SY23 3HH to let us know.